Some weeks ago I was reading Pat Shaughnessy, Ruby Under a Microscope that is an excellent book about all the engineering behinds Ruby language, and when reading, sometimes I was feeling lost with myself when reading some C codes from Ruby implementation then I decided to stop reading the book and start a little review about C programming language because the last time that I wrote some C code that wasn’t on Arduino was ~3 years ago at my university. When I was at my first university, I clearly remember how some students feel lost and some students feel delighted with the theory and concept of pointers, and for me, was fascinating. On this post, I’ll try to explain in a simple and practical way all the theory behind C pointers, for on the next posts I write about topics like Static and Dynamic memory allocation and function pointers. It’s easy to create programs impossible to read and alter if you don’t give the appropriate attention to the pointers that you’re creating. To understand pointers correctly, first, we need to understand from a top-level view of how the computer memory works. The computer memory is like an array, is a block of consecutively memory cells order by their addresses, that memory can be manipulated alone or in groups. The C Lang picks 4 consecutive memory cells (bytes) from the memory and stores the value that you assigned to the variable. And remember each memory cells that you requested to store your integer have a memory address that can be referenced by an hexadecimal. This address will vary on each execution of the program. Pay attention to how C allocates the variable age exactly 4 bytes after the first one, this is because the integer needs 4 bytes to be stored. The memory address is very interesting and would be good that we can store it at variables and make nice operations this, and that’s is what pointers consist. 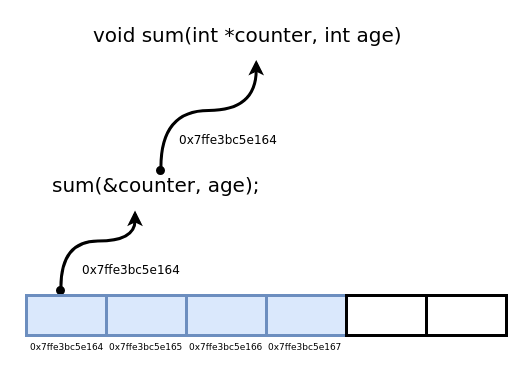 Pointers in computer science is an object (usually a variable) that stores the memory address of another value. In C you can declare a pointer using an asterisk before the name of the variable and store an address of a variable of the same type of the pointer. Note: Pointers always point to a specific data type, we have one exception on type void. When a pointer is pointing to a value, the pointer only stores the address of the first byte of this value, when asked, C uses the data type of the pointer to walk over the next n bytes to see the full pointed value. For example, if we’re pointing to an integer and the first byte of this integer is locatted on 0x7ffe3bc5e164 (see the previus image), the pointer will only store the 0x7ffe3bc5e164 and when asked for the vallue will know to walk +4 right because integer is a datatype of 4 bytes. You can do arithmetic and logic operations with pointers too, on this example I sum 10 to the value pointed by pointerCounter. With pointers we can do a lot of things, one of the main things is pass values by reference to functions. When you pass a something to a function in C and make changes to it, that changes won’t exist outside of that function scope, what its means? On this example, we send the counter variable to the void function sum that stores at counter the sum of counter and age, after this we print the value of counter inside the function an we see the value 15 printed, but on the printf outside the function at main, we got 10, why? This is what we call pass by value and C passes arguments to function by value, almost all languages pass by value (Java, C#, Ruby, Python), and there isn’t direct way for the called function to alter a variable in the calling function. But in C we can do what we call pass by reference, we call the function passing variable address and receiving as a pointer, doing this you’re saying to function “Hey, that’s the value memory address, pick this and alter as you want”. If you run this code you’ll realize that on last printf the counter is 15, that’s why we’ve passed the counter address to sum function, and at function we do the operation directly on counter address on memory. This is what we call pass by reference, we aren’t passing the value to function but it’s reference at memory. On this post we talked about all the basics behind pointers in C, it’s not a simple topic and if you don’t understood keep trying and run the examples of this post on your own machine, you can also read the sections 5.1 and 5.2 of the legendary K&R C Programming Language that’s on my opinion is the best book of ANSI C.
On next three posts I’ll talk more about pointers, I will write about pointers in arrays and strings, dynamic and static memory allocation and function pointers. Feel free to ask any questions at my twitter, email or comment this post.